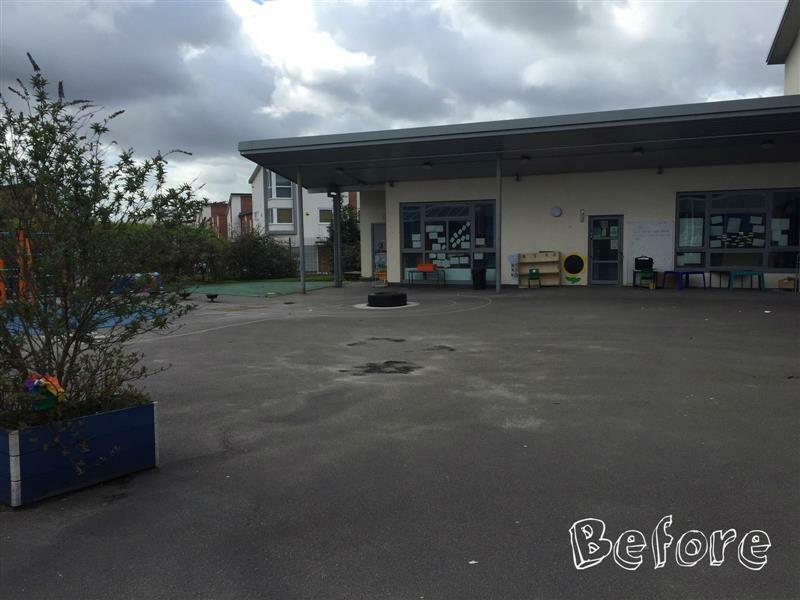 Our Managing Director and Owner, Andy Snell, worked closely with Ashbury Meadow Primary School to redevelop their Early Years, Key Stage 1 and Key Stage 2 outdoor areas. Continuity was important to the school, as they wanted their children to have continual development from Early Years through to Key Stage 2 but with a higher level of challenge as they progressed and grew older. 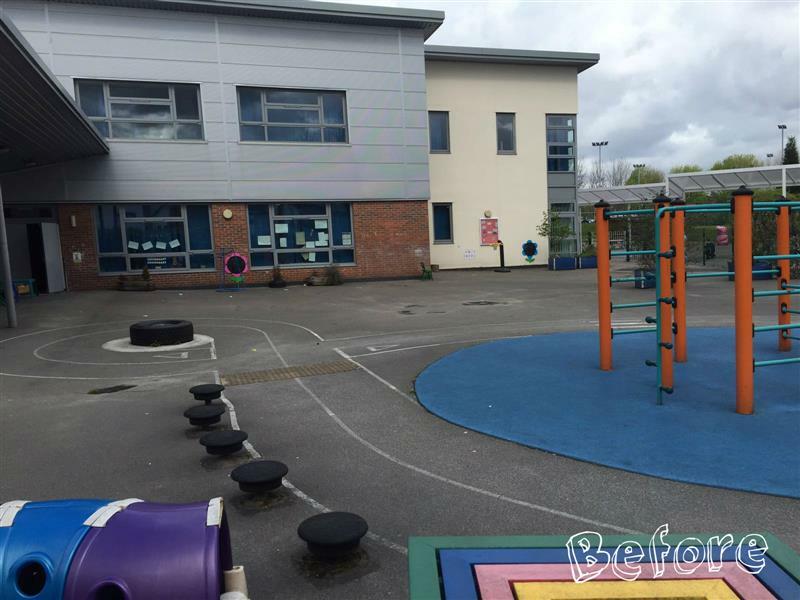 To do this, we ensured the playground challenges children faced when in Early Years, were replicated when they moved on to their Key Stage 1 playground but with a higher level of difficulty to ensure they continued to progress and develop. "Continuity is key as it gives children confidence and enables them to embed skills in different areas. 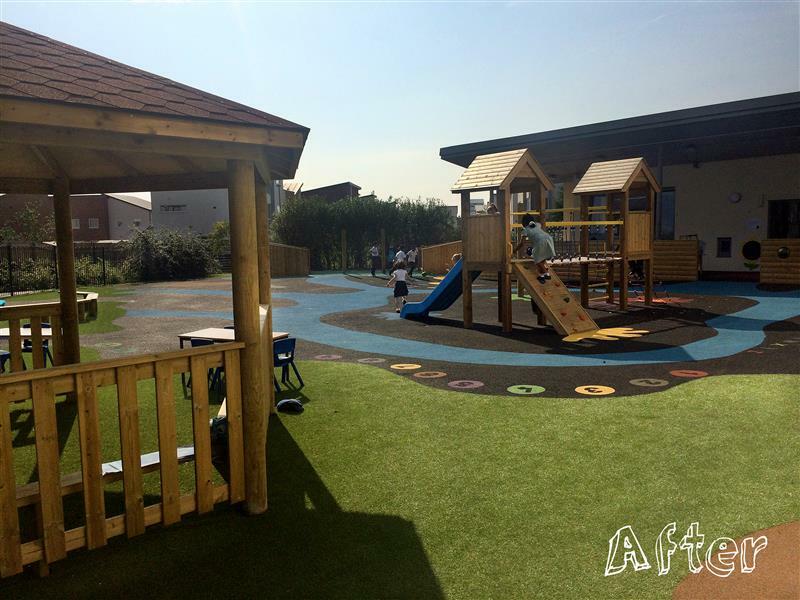 So Andy and I took the EYFS framework and the areas of learning, and ensured this learning was continued on each playground from Early Years to Key Stage 2 but with a higher level of challenge as the children progressed." 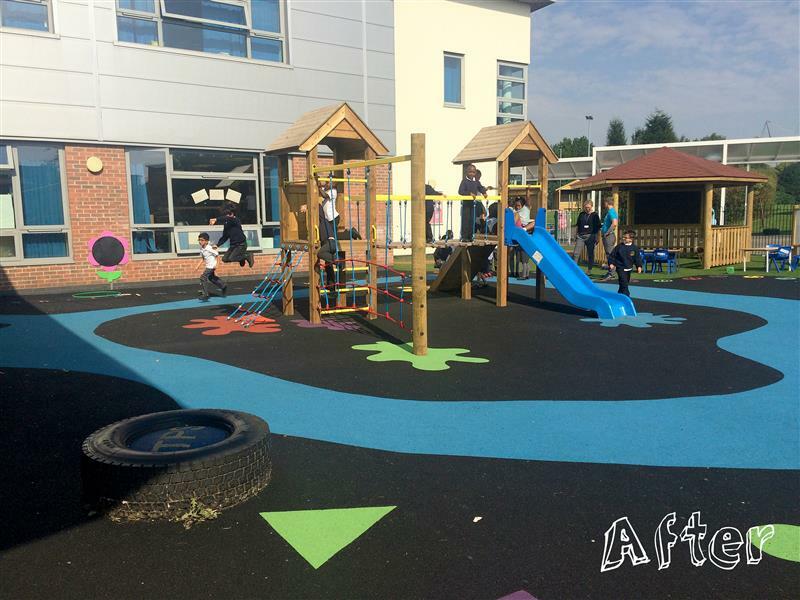 " We didn’t want there to just be an incredible Early Years area and then nothing on the Key Stage 1 and 2 playgrounds, we wanted their progression to continue and the equipment to match pedagogical needs". Before our development, the early years playground had limited resources with a concrete surface and an old Manchester City Council climbing frame as the main attraction. Unfortunately, the climbing frame had rather high challenges which were too difficult for the younger children to complete. 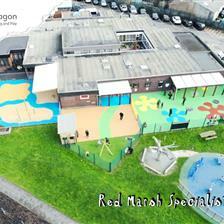 The area needed a huge revamp to offer more opportunities for learning when outdoors. We transformed the area to offer the children more inclusive open-ended opportunities with a real focus on imaginative play. For instance, the children now have distinctive zones for physical, mark-making, performance, imagination, quiet time and story telling. We also added further weather protection to the Canopy area to ensure outdoor learning could continue come rain or shine. The old concrete was replaced with a captivating surfacing design, full of colours and additional learning opportunities for subjects such as Mathematics. It not only provides the children with a safe and fun environment, but also offers children the opportunity to experience different textures. "The children now have lots of opportunities to enable challenge and interaction with each other, with an emphasis on role play and imaginative play. For example, the imagination zone can be transformed into anything by the children and also encourages construction and den-making. The area is zoned for outdoor performance, reading, mark-making and physical development.". "The new surfacing was an important pat of the project because it enable children to experience different surfaces and textures. 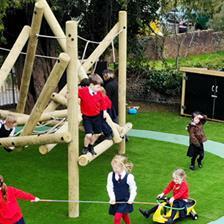 The playground surface now has lots of new opportunities that the children love to experience." We added an Outdoor Gazebo to create a zone for outdoor lessons, mark-making and even quiet time when children are relaxing away from the physical play equipment. The Gazebo can seat an entire classroom, but with the addition of our comfortable and natural looking artificial grass, children can also sit on the ground to engage in lessons. It provides shade on a sunny day and due to its waterproof roof, the Gazebo can be used in all weathers. We worked closely with Lucy Thomas to design a fantastic outdoor classroom that includes extended raised decking that can be used as a performance stage. This classroom area can now be used for lessons, language development, outdoor performances and Key Stage 2 plays and dramas. The classroom has a double pitch, waterproof roof and eight wooden picnic tables with a chalkboard top. It also includes a Giant Whiteboard which is a fantastic teaching aid and can be seen clearly from all angles of the classroom as well as being great for children to practice writing on. During lunch time, children are free to use the classroom to relax and socialise in. 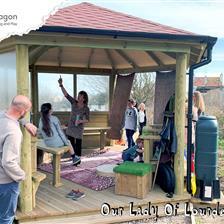 "We designed this fantastic outdoor classroom with Andy. A great feature is the extended decking which can transform into an outdoor performance area. We now have an outdoor place to support speaking and listening, pupils can work here to develop plays, poetry, music and dance performances. As well as all this, children can come here to relax during lunch times, read books, play board games or do art work: which is great for those who don’t want to climb or take part in anything physical". For the Physical Play Zone, we made sure the climbing challenges were open-ended and accessible from all angles giving the children no obvious way to enter the area. To ensure this was possible, we installed our Helvelly Log Climber with Climbing Wall. This includes an integral scramble net, rope handrail and rope with traverse holds which will develop children's balance, upper and lower body strength, gross motor skills and climbing confidence. Next to this log climber, we installed our massive Apollo Challenger which features 16 different challenges. The Challenger provides a variety of physical challenges covering balance, upper and lower body strength, hand strength, core stability, task and gross motor skill development. The combination of equipment makes this challenge a group one, encouraging cooperation, competition, and imaginative play. "Instead of a linear trim trail, Andy has created a climbing challenge with no queuing, making it accessible from all angles which is why so many children can use it at any given time. There is no obvious way to enter the challenge, making it much more exciting for the children. They have to communicate, work in teams, problem solve as well as improve physically." For further physical and imaginative play, we installed our enchanting Langley Play Castle giving children plenty of role play opportunities. The castle sits in a wooden area to further fuel children's imaginations and give them the additional feeling of being up on a treehouse. As well as fun imaginative games, teachers can take classes up to the top for story time to create the perfect setting for fictional stories. "The children now have lots of opportunities to interact with each other, with an emphasis on imaginative play. Physical development is a target area in our EYFS. Andy from Pentagon therefore created specific pieces of equipment in EYFS to encourage the children to crawl, climb, jump and enjoy playing outside. "We’re really, really pleased with the whole development. All we did was explain our children’s needs and Pentagon came up with a solution to provide for them. We had specific focuses for each area which was very important and Pentagon understood this fully. I highly recommend them to anyone looking to develop their outdoor environment." Are you looking to develop your outdoor environment to ensure your children have fantastic continual development from Early Years to Key Stage 2? Feel free to Contact Us for a free consultation.